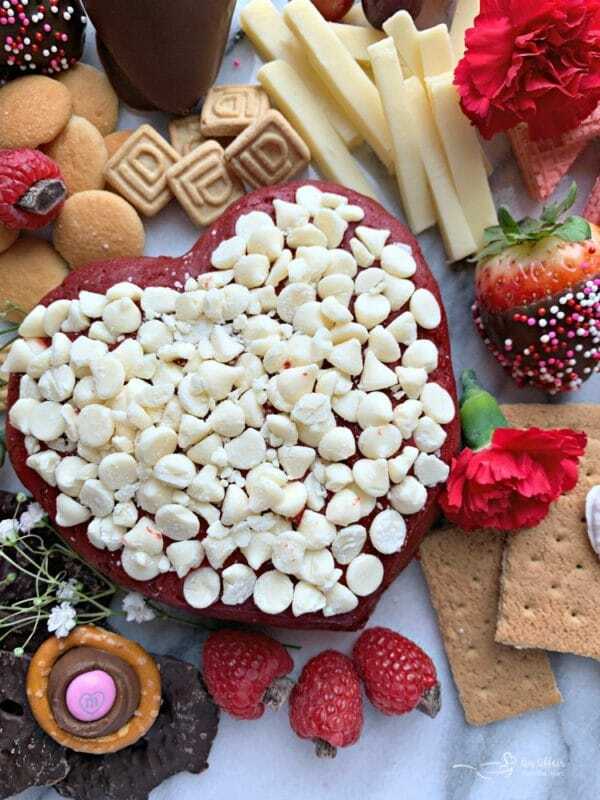 This Valentine Dessert Cheese Board has a heart shaped red velvet cheese ball and assorted fruits, cheeses and sweets to share with your special someone. 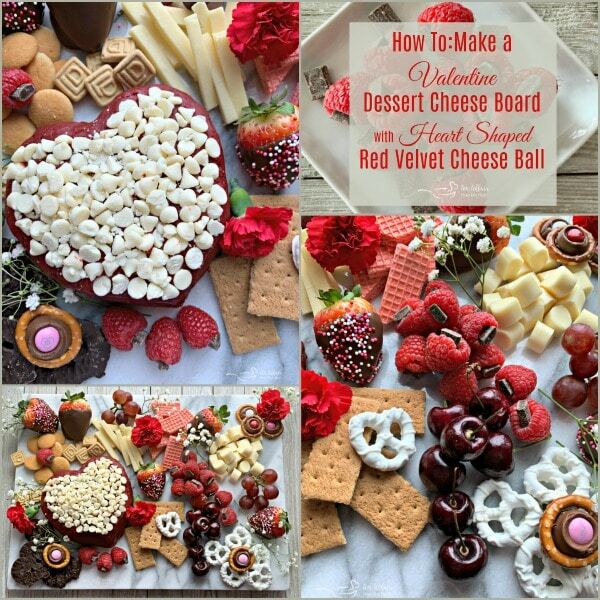 This Valentine Inspired Dessert Cheese Board is my first Dessert Cheese Board to hit my blog. What better time than for Valentine’s Day? 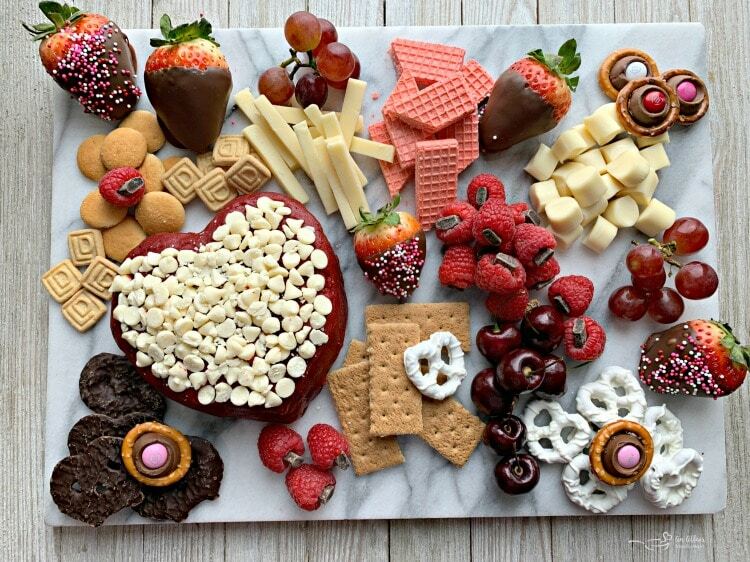 Whether you are snuggled up with that someone special, having game night with the family, or maybe even having a Galentine’s Day get together with your favorite gal-pals, this cheese board is perfect. 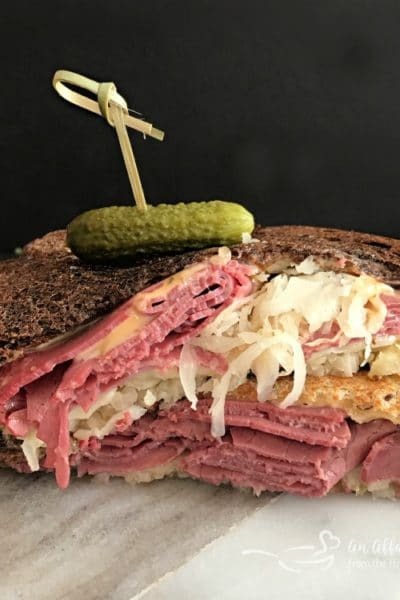 Snack time, happy hour, wine time, dessert, its super versatile, and easily adaptable to your tastes and the company you are keeping at the time. 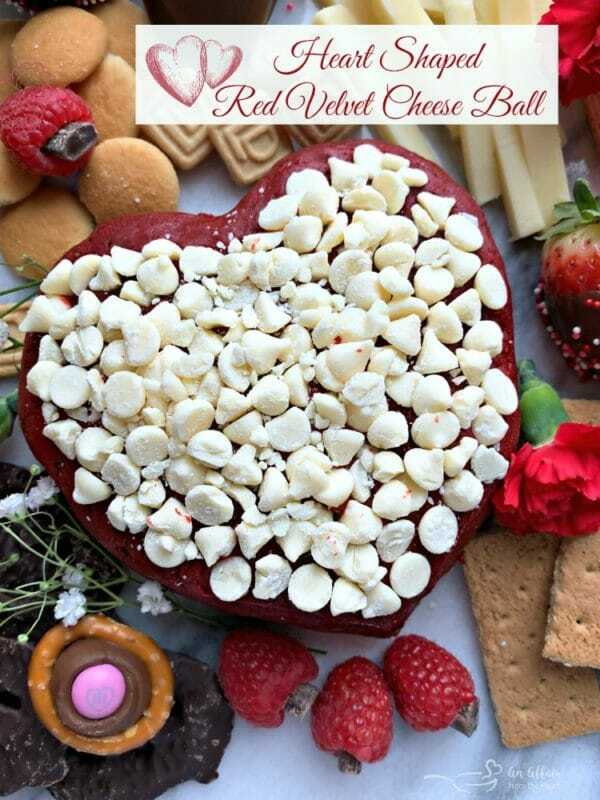 The center-piece of this sweet cheeseboard is most certainly this heart shaped red velvet cheeseball. Of course, if you have happened upon this post, and it’s NOT Valentine’s Day — you can make a traditional cheese ball. Whatever you do, just make the cheese ball! It’s like red velvet cheesecake, all dressed up with white chocolate chips. Serve it with graham crackers, vanilla wafers or shortbread cookies. Or eat it with a spoon. No judgment here. 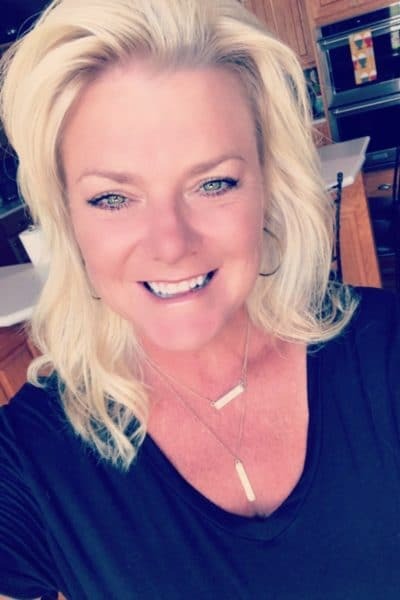 For many years, when my kids were younger and most of my friends were stay at home moms, I held a Valentine brunch every year. It was one of my favorite things to host every year. It was always full of good food, and good friends. One year I had a “Spicy Valentine’s Luncheon” and we drank margaritas and ate Mexican food. One year, everyone came for brunch and we all wore pajamas! I think that year was my favorite. You can see those old posts in my Valentine archives. As the years wore on, and so many of my friends went back to work, it got harder and harder to have a brunch. Then we started visiting my in laws in San Diego over Valentine’s Day, because our kids always had time off from school. I haven’t had one for a long time. I have been considering starting it over this year? I know it’s hard to have a luncheon, but I am pretty sure they would be game for happy hour!! Don’t you think that this dessert cheese board would be well received? Like I mentioned, you can easily adapt the cheese board to your likings. 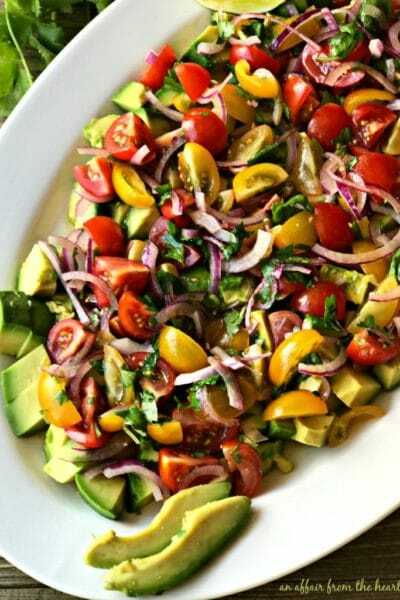 You can make a large one for a bigger crowd, or keep it small or a more intimate gathering. Today I will share some ideas for things that make this a great dessert board. But I welcome you to tell me what you think would be a great contribution. I started with a white marble board. 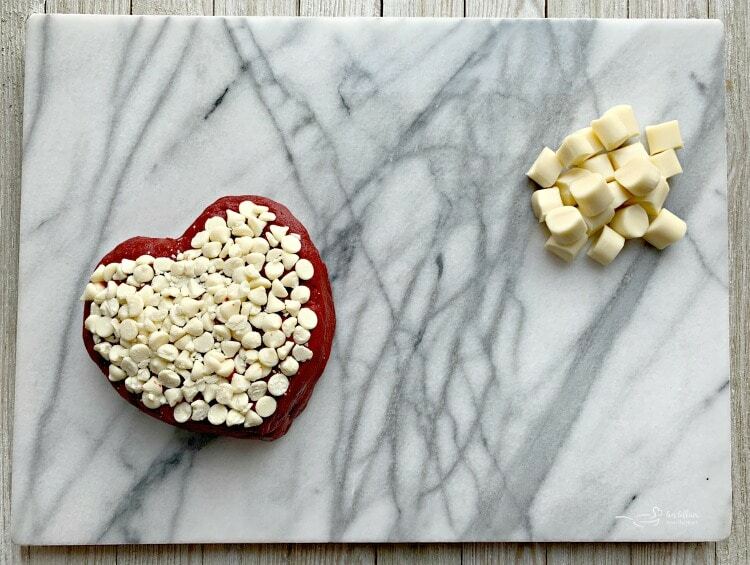 Added my Red Velvet Heart Shaped Cheese Ball, and bite sized pieces of mozzarella string cheese. I decided after the fact to add one more, and cut some white cheddar into “matchstick” slices. Next up, graham crackers, some mini Lorna Doone Shortbread cookies and vanilla wafers. Next up, I made some little Rolo pretzels, by melting a Rolo candy into a circle pretzel and pushing an M&M into the center. 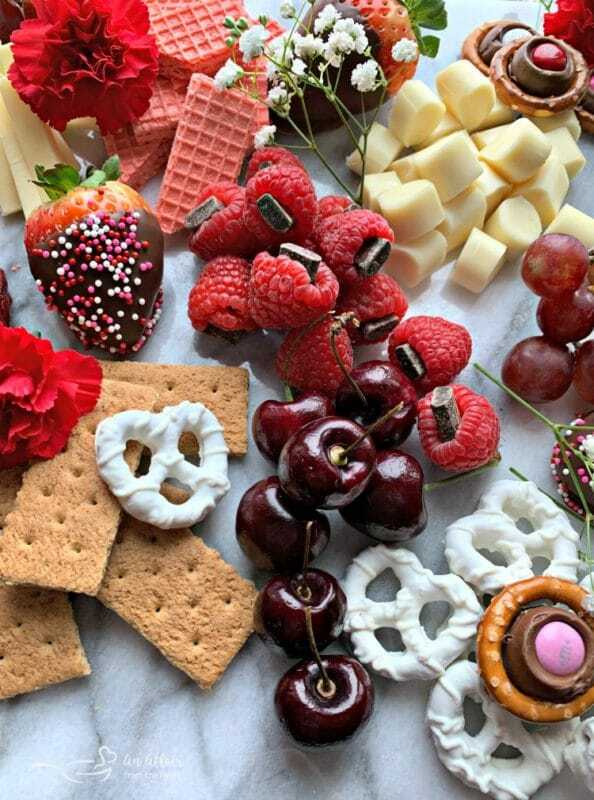 I purchased some Dark Chocolate Dipped Pretzel Chips and some white chocolate dipped pretzels and some pink strawberry wafer cookies that I cut in half. I tried to stick with white, red and pink. Next I added my fruit. I added some bing cherries, red grapes, chocolate covered strawberries and raspberries stuffed with dark chocolate. I took some dark chocolate chunks that I bought in the baking section, and stuffed them inside of my raspberries. That flavor, chocolate and raspberries? One of my favorites! I dipped some strawberries in milk chocolate, and dusted some of them with sprinkles. 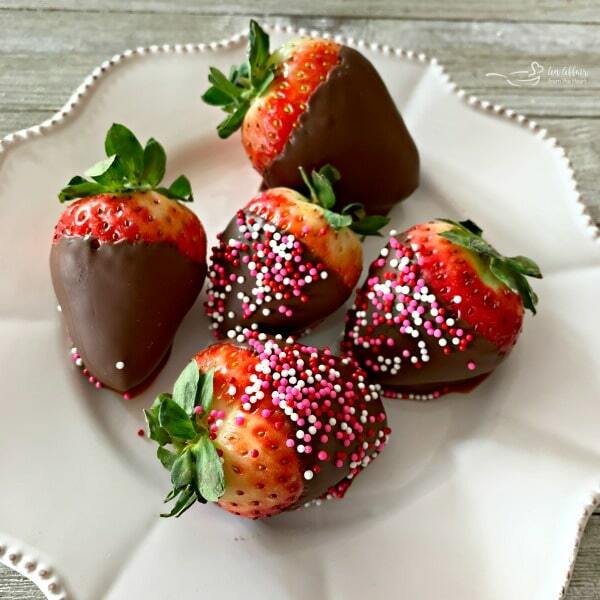 If you have never chocolate covered strawberries before, you need to try it!! Buying them is so expensive!! Here is a great tutorial on How to Dip Strawberries. Whether you use white chocolate, dark or milk chocolate, they are incredible, and they make such a beautiful presentation. Want to really take it to the next level? Try these Samoa Strawberries! yum! Typically, I like to add fresh herbs to my cheese boards. This time, I thought it would be fun and festive to add flowers. I picked up some red carnations and some white baby’s breath. I thought it added a nice touch. Don’t you? How ever you celebrate — I hope your Valentine’s Day is a special one! This spread looks amazing! I would definitely be super happy to see this on Valentines Day! 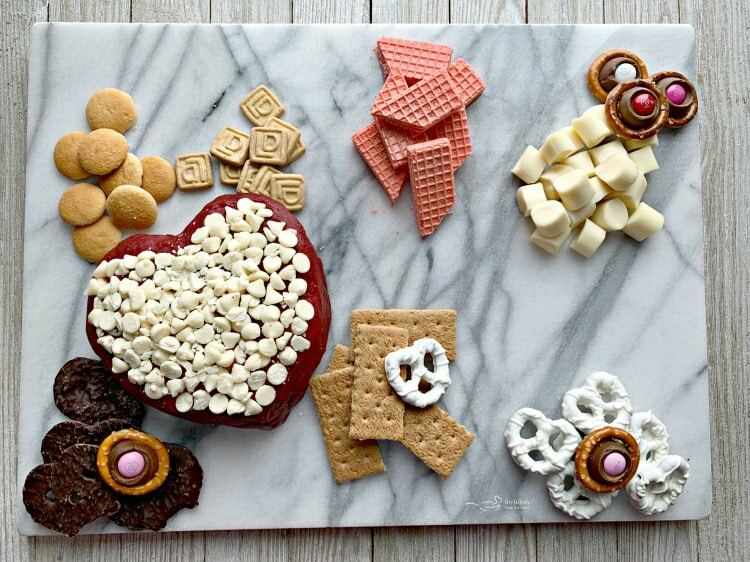 This cheeseboard definitely spells Love and is perfect for Valentine’s Day! Such a healthier alternative for the Day of Love! I do not know if I can wait for Valentine’s Day to try it. 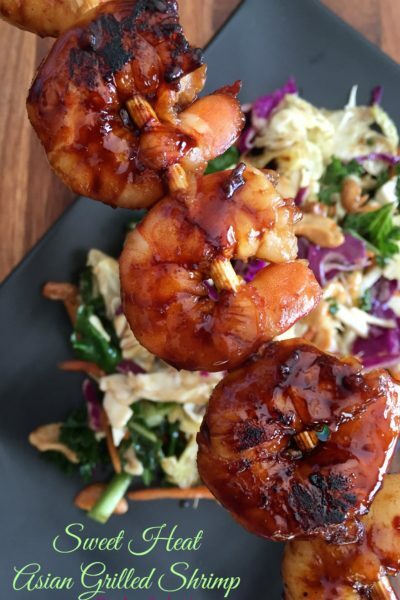 Looks so beautiful and tasty! We are staying in on Valentine’s Day, so this would be perfect! You can’t beat a cheese board. 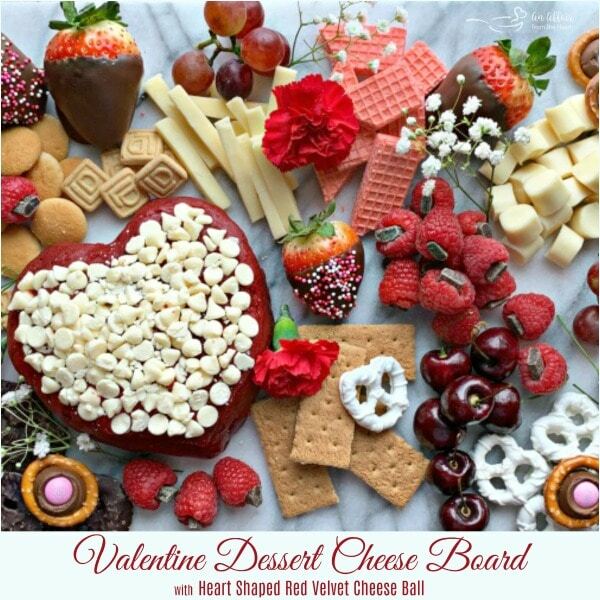 I definitely like this idea of a dessert cheese plate for Valentine’s! I often have a bit of red wine in my glass after finishing a meal, so cheese works better than straight sweet for dessert in that case. I love the creativity here! 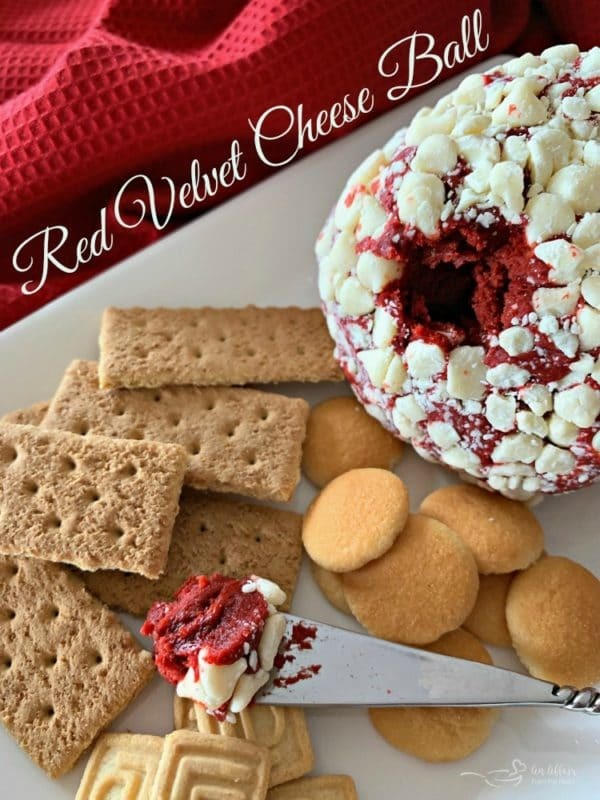 That red velvet cheese ball is so cute! Love the spread for a Valentines day date night in!! You know Brooks and I are all about some cheese boards and this is no exception! 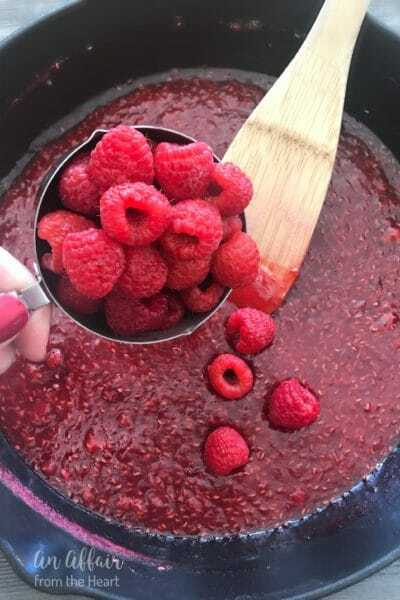 I love that you stuffed the raspberries with chocolate chunks! What an adorable idea! 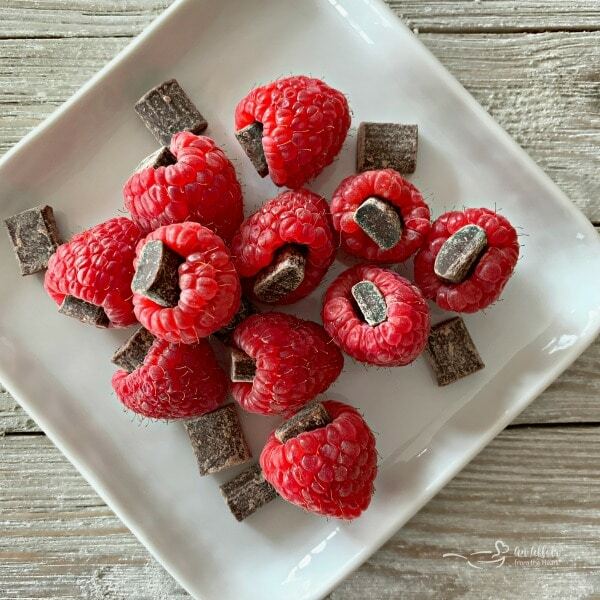 I love the chocolate stuffed raspberries, and it all looks so pretty. This is such a cute idea!! 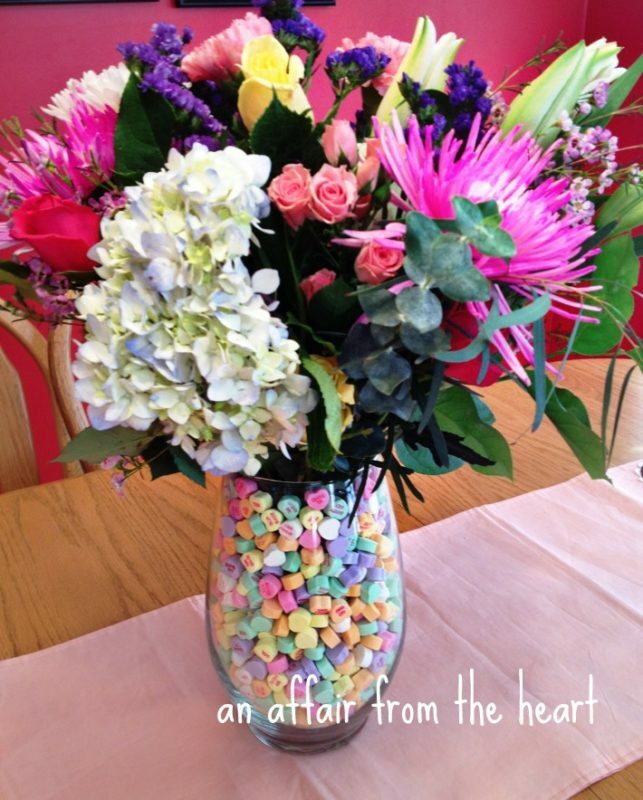 You better believe this is going to be at my galentine’s day party! This is seriously the most fun cheese board I have ever seen. 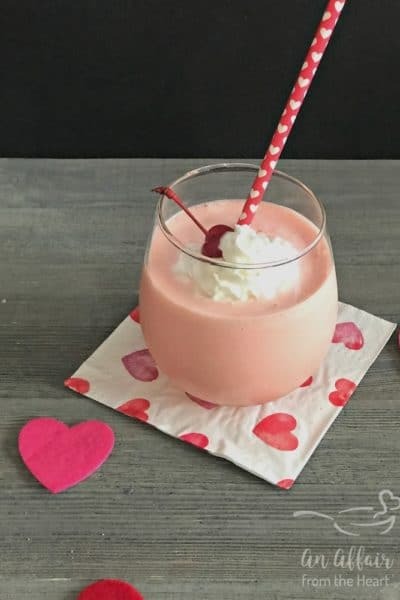 I’m totally making this for Valentine’s Day this year! What a fun and romantic cheese board to share. I love how cute that red velvet heart is too! This is the prettiest dessert board I have ever seen!!! I’m such a huge fan of cheeseballs, I’m kicking myself that I didn’t think to make a dessert one! Hands on desserts are so fun! This is such a good idea! We rarely go out on Valentine’s Day to avoid the crowds but do something special at home and this would definitely be special and a hit! Love, love, love! 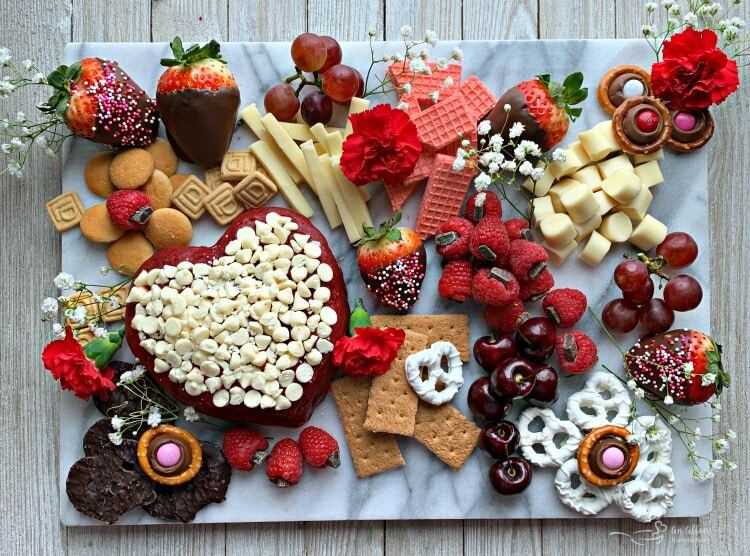 I wanna have a pajama party and dig into this pretty dessert cheese board! Beautiful to look at and all those tasty goodies are calling for me! The cheeseball is so creative!